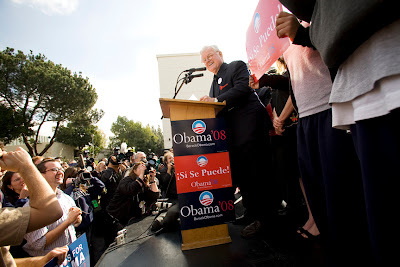 Senator Edward Kennedy made a campaign stop to support Barack Obama in East LA. He spoke at a rally held at East LA Community College. Senator Kennedy even spoke spanish to the crowd of students and Barack supporters. He had to translate his Spanish back into English due to his heavy Boston accent. He said he was trying for a Castilian Spanish accent.